Get EzyGold products licenses for free by purchasing the EzyGold, ezyCart, or EzyAlert products. Due to too many request and overwhelming response, we are happy to offer a second phase of our special deal "Buy One Get Two" program. This offer is only for 3 days and valid until 12 May 2010. For a limited time only, get special discount 20% by purchasing EzyGold Script. If you previously already own the EzyGold license and you want to purchase additional license, you will get a whooping 40% discount (you need to include your existing username when placing an order to get benefit from this offer). *) This offer is a cashback discount, it's mean you need to pay full in front (based on the version you purchase), then we will return your money (20% or 40% from your script or software purchase amount) after your payment confirmed and you claim the cashback (up to 14 days after purchase). *) The discount available for EzyGold and EzyAlert purchase only! New additional themes available for download in the EzyGold.com member area. Below is the screenshot of the new themes. 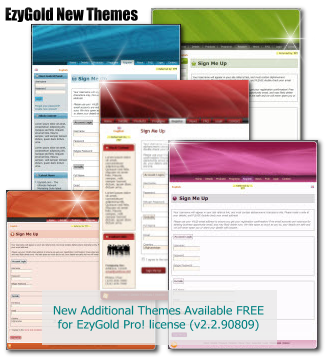 This new additional themes available for EzyGold v2.2.90809 Pro! license holder. ++ Exclusive 3 additional themes also provided for private label license key owner. New version of EzyGold v2.2.90809 is available now. It's a full release since v2.2.80612 with some features improved and some new features added. include the downline details (custom fields, address, city, state, country, etc) in the members back office. This new version is recommended to anyone who want to get more advanced and stable features of EzyGold system. If your download date not yet expired, you can download it from your EzyGold.com member area, if not then you can extend your download date for small fee to get this new version. We glad to notify that EzyGold.com site already updated, this update including the core system and the site look and feel. We also update our support system to make it better and easy to use, and change the url address for it. Due to server migration, our site was down about 21 hours and now it's should back to normal and you may access the site without any issue. If you previously (within 24 hours ago) sent an email to us, please resend it since we may didn't receive your email. New version of EzyGold v2.2.903 is available now. It's a release candidate 1 (RC1) with some features improved and some additional new features. This release is a controlled version, it's mean the download files not yet available in the members area, if you want to try this new version and already own the license of EzyGold script (and your free update not yet expired) you may request it by open a support ticket and provide us with your EzyGold.com username and email address. We will send the download link or attachment file to you. P.S. If you previously already own the EzyGold license and your download date (free update) already expired, you can still get access to this new release by extend your download link, and get a free ezyCart script* or EzyAlert Client version** as a bonus (limited offer). Please contact us for details. P.P.S. Already purchase our scripts and looking for inexpensive hosting provider that support our script?, you may visit our FAQ page to get the answers. *) This offer available for Pro! license holder only. **) This offer availale for Pro! or Biz! license holder. 59. Happy New Year 2009! EzyGold.com sincerely congratulates all of our customers, visitors, and friends on the occasion of the coming New Year! Best wishes of health, prosperity and happiness. Let the coming year bring all of you more success! The EzyGold.com Office joins these warmest wishes and would like to inform that the office will be on vacations for the period 29 Dec 2008 - 6 Jan 2009. Thank you for your understanding. P.S. All online orders will be processed as usual without interruption. 60. Extended Upgrade Date Special Offer! As you may already know, we always continue to improve and add new features in our EzyGold products and we will continue to release new version of EzyGold products. It's the time to get ALL benefits from the latest version of EzyGold software (current version and next release), extend your upgrade date+ now. EzyGold Pro! version - 12 months extended upgrade special offer $249 limited offer! + As long as your upgrade date not yet expired, you can download the latest version of EzyGold products for FREE! * This offer is available for previous customers only and for the upgrade date only (not Biz to Pro version upgrade). * Upgrade date will be extended from the latest expiration date, it's mean when the upgrade date already expired 6 months ago, then pay two extended upgrade is required to benefit from this offer. Default upgrade date is 6 months after purchase. * We accept payment through AlertPay, and Liberty Reserve. Please contact us for details. Get 10% private discount* by using coupon code: 10P5only for all EzyGold.com products and/or services. *) limited offer, valid for total order amount $975 or greater. **) Unfortunately, this offer no longer available! Due to holiday season starting from 1 Oct 2008, all enquiry response time will be changed. We will response all sales or support enquiry (both using email or support ticket system) within 1-3 days. It's will back to the normal on 6 Oct 2008. P.S. There is no change for the order process. All the order or purchase will be processed automatically. New version of EzyGold v2.2.80612 ready to download! Important! Customers who already download v2.2.80612 must re-download it from member area, some files already updated. This new version 2.2.80612 come with 2 additional EzyGold themes (Becmos and Blusky) and this free themes available for Pro! license holder only. Interest with our EzyGold Products? wanna buy it? If your answer for above question is YES, then we personally urge you to purchase our products right away since for few days forward we plan to increase our products price!. Do not waste your time, buy now and save $$$! We are about to begin to move EzyGold.com server to our new stable server. We will be taking down our current servers soon and we will try to keep this move quick and painless as we possibly can, and we apologize for the inconvenience. New version of EzyGold products released. Any customers running a version of EzyGold 2.1 or earlier are advised to upgrade to take advantage of the improved stability of the new version, which includes bug fixes. By releasing this new version, we no longer provide support for version of EzyGold 2.0 or earlier. Get extra EzyGold theme, pre-made blank header and tool (ie. eToken) for EzyGold Pro! license holder for FREE. Login to member back office to get / download this extras. Currently, we experience difficulty to access our email, we are now working for this to resolve the issue. If you sent an email to us and no response, please wait till this issue resolved. Please apologize for any inconvenient that may occur. P.S. The new version of EzyGold almost ready, we will release it soon. The new version of EzyGold and ezyCart Plug-In already released (build 80214). This release for update and known bugs fixed and also change the way how the software detect user IP Address. As a bonus, this release also came with pre-made 5 headers logo (high resolution .jpg file) that compatible with default EzyGold template. Upgrade to the new version (both EzyGold and/or ezyCart Plug-In) is highly recommended. What's new in EzyGold version 2.1 ? What's new in ezyCart Plug-In version 1.5 ? If you are already purchase the EzyGold software license in the past 12 months, you can download this latest version for FREE directly from your EzyGold.com member area. Upgrade to the latest new version is highly recommended to avoid any security issue that may occurs. EzyGold v2.1 is ready, if you want to try this new version, please contact us to get the download link. This offer is available for all customers who purchase the EzyGold v2.0 in the last 12 months. This new version will available in the next 14 days (or less) in the download area of all customers who have a right to get free updates. Zend Optimizer is not required anymore to get the script to run!. Get a FREE license of EzyAlert - EzyGold Notifier Client version (price: USD $97) for FREE by purchasing EzyGold Pro! version. The license will be valid for UNLIMITED members with single EzyGold Pro! license (one domain name). This is a limited time offer and valid for 15 days only, from 10 Dec 2007 till 25 Dec 2007. We are back from 'long' vacation and our office have open and now ready to provide support for our products and services. During on vacation, we get a lot of email and support ticket so we shall need time to answer all these existing emails and support ticket and we hope all of these inquiry will answered before 29 Oct 2007. We are now on vacation and our office closed for several days (its about 5 or 7 days), we will try the best and our tech support will available to response any emails or support tickets within 3 days or less. Although our office on vacation, all transaction will be processed as usual. Own a Competing Product? If so, you can get a 15% discount on the cost of EzyGold Biz! version! To claim a discount, you must provide proof of active ownership of another system to us. Please contact us with a receipt or invoice with your name listed as the owner. You must 'own' the competing product, not lease, and it must be of value of no less than $150.00 for an owned copy. Upon successful verification of ownership of a competing product, we will email you back with a coupon code to discount you 15% off either of our owned EzyGold Biz! version license types.